Connor is Native American. He's a member of the Mohawk tribe. He sees his tribe's village destroyed and wants to take action, according to some basic bulletpoints the game's team shared, though the fact that ACIII is still in development means things could change. 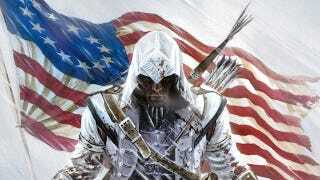 Something drives Connor to the Assassins, this ancient order dedicated to combatting the equally-ancient Templars and to help people be free. Still no lady assassin... Assassin's Creed lore is full of female assassins, but we've yet to be able to play one in the game (though we have played as female Templars in the game's multiplayer. Why not feature a heroine as the lead in AC III? "It's always up in the air," the new game's creative director, Alex Hutchinson, said, "I think lots of people want it, [but] in this period it's been a bit of a pain. The history of the American Revolution is the history of men. … There are a few people, like John Adams' wife, [Abigail]—they tried very hard in the TV series to not make it look like a bunch of dudes, but it really is a bunch of dudes. It felt like, if you had all these men in every scene and you're secretly, stealthily in crowds of dudes [as a female assassin], it starts to feel kind of wrong. People would stop believing it."